Today, around 60 different public authorities, municipalities and stakeholders have to coordinate their efforts in order to make the lives of unaccompanied minors seeking asylum in Sweden as good as possible. Co-lab Sweden (Förnyelselabbet) is run by the Swedish Industrial Design Foundation (SVID) with direction from the SKL / Swedish Association of Local Authorities and Regions (SALAR). Together, they have chosen Custellence as a primary customer journey tool to help them coordinate efforts and systematically improve the lives of unaccompanied minors. – This project’s success is determined on how well we, as a system, can deliver solutions that make a positive impact in the unaccompanied minors lives and respond to their needs. We’ve got four challenges in this initiative: to create an overview, set up new collaborations, innovate with the target group in mind and simplify implementation. 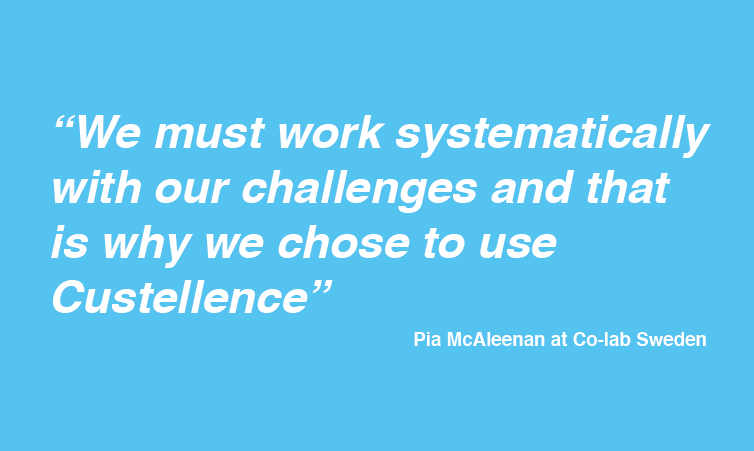 In order to meet these challenges we must work systematically with our challenges and that is why we chose to use Custellence as our digital tool, says Pia McAleenan at Co-lab Sweden. Using the customer journey as a starting point ensures that the improvements and concepts that come out of the process will be in line with the minor´s dreams, situation and needs. Custellence provides a digital structure for collaboration when planning the development and implementation of new concepts. – Engaging people, keeping the bigger picture in mind and collaborating without having to be in the same room are important aspects in this project. We hope to find and solve uncovered spots in the customer journey and fuse new collaborations leading to a better situation for refugees’, says Pia McAleenan. Transformator Design is the Custellence Partner that coaches Co-lab Sweden in using Custellence. Custellence Partners make up a network of experts who help organisations to succeed with their customer centricity. Both Custellence and Transformator Design are very proud to be able to contribute in an engaging and important social challenge as the Co-lab.